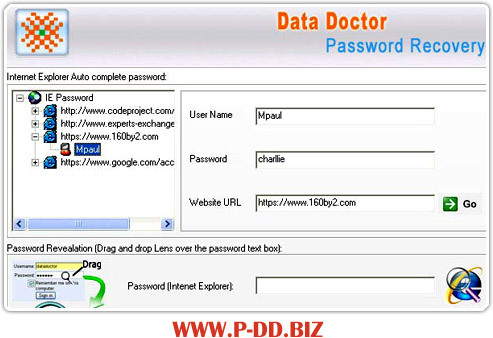 Internet explorer password recovery software is easy to use password recovery application which recovers all internet explorer saved passwords and unmasks all Windows applications. Restore Passwords to web sites saved in Microsoft Internet Explorer (in local password list), as well as auto complete strings (form fields). Safely recovers user name from auto complete field. The software supports all versions of MS Internet Explorer and recovers the password instantly. Recovers all Internet explorer saved Passwords list. Retrieve E-mail account passwords/logins instantly. All versions of MS Internet Explorer are supported. Support recovery of all multilingual passwords. Easy to use with user friendly GUI interface! Allow to save password to the user specified location.